Prasorizo (Leek Rice) – Elly Says Opa! I was intent on getting a rice cooker for our wedding 7 years ago. It’s sat in the box for about 6.95 of those years and has become a point of contention in our marriage. Because…I don’t use it. And really, there’s no room for it. But for some reason, I refuse to get rid of it. To be fair, Tom still owns a laptop that has not worked/turned on since 2006. I mean, at least my useless item could be useful if I took it out of the box, right? The thing is, even though it took me nearly 30 years, I learned how to make the perfect white rice—and not in a rice cooker. And it’s been hard to have pretty much any other rice ever since, because steamed white rice is so good and fluffy and goes with everything (if you guys are interested, I will do a blog post about it at some point). However, recently I started thinking about prasorizo, and couldn’t get it out of my mind. 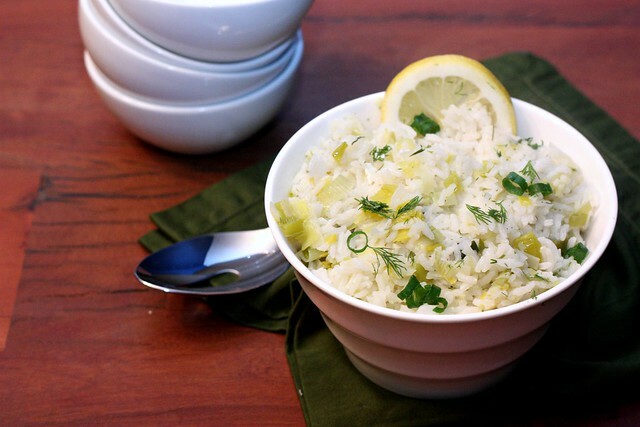 Prasa, or leeks, are cooked alongside rice and it’s all finished off with a healthy dose of lemon juice and dill. it’s a nice, bright side dish that can be served with pretty much everything, though on this particular night we had it with keftedes. Heat the olive oil in wide saucepan over medium heat. Add the leeks and the green parts of the onions. Cook, stirring occasionally, until the leeks have softened and reduced in volume, about 5 minutes. Add the rice, coating the kernels with the oil, and toast for about 2 minutes, stirring continuously. Stir in the garlic and cook until fragrant, about 30 seconds. Add the water. Bring to a boil and then cover the pot and reduce the heat to low. Cook for about 15-18 minutes. Off the heat, stir in the lemon juice, dill, and salt and pepper to taste. Re-cover the rice and allow to steam in the pot for 5-10 minutes before fluffing and serving. Top with the green parts of the scallions.